We are the answer to your dishwasher problems. We have served the Portland OR area as a quick and efficient dishwasher repair service provider for numerous years. Our approach has provided countless successful fixes to clients in need of a dishwasher repair in Portland OR over the years. If your dishwasher is leaking, not fully cleaning your dishes, not turning on or performing as it did when it was new, give us a call and we will get it fixed. No dishwasher is unfixable if you have the right Portland dishwasher repair company. It is only a matter of the extent of the repair job. Usually a dishwasher will be fixed by swapping one or a few dishwasher parts. The cost of most dishwasher parts is negligible. We work quickly and offer affordable labor rates, plus we have a $10 discount on your first repair. Our company also does not charge for the service call if hired for a repair, making the visit even more affordable for you. To top it off, if we save on the parts you need when looking to buy dishwasher parts in Portland OR, we will pass the savings on to you. There is a reason that people choose us when they need their dishwasher fixed. We have a huge list of happy clients that contacted us with a non-working or poorly working dishwasher and ended up having us leave with it performing just like new again. We are proud to say that we are a leading provider of dishwasher repair services in the Portland OR area. 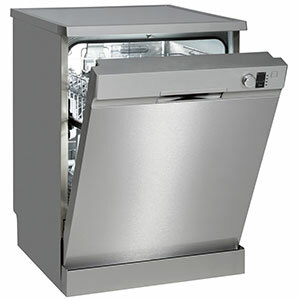 We are confident that you will be satisfied if you choose us if you ever require a dishwasher repair in Portland OR. The majority of dishwashers are under-counter models, meaning they get installed under the countertop. These are not ideal for any kitchen with concrete, granite, or quartz countertops. If your countertops are made of any of these materials, you may want to consider a dishwasher that is installed onto the side cabinets instead. Regardless, keep in mind that you will want your dishwasher to fluently blend with the rest of the kitchen, which includes your countertops. If your cabinetry already has a dishwasher opening, you may have no viable alternatives.